With the development of digital printing technology in recent years and the decreasing demand for woodcut printing, we are facing a critical situation in which there are fewer artisans and successors of traditional woodcut printing techniques. 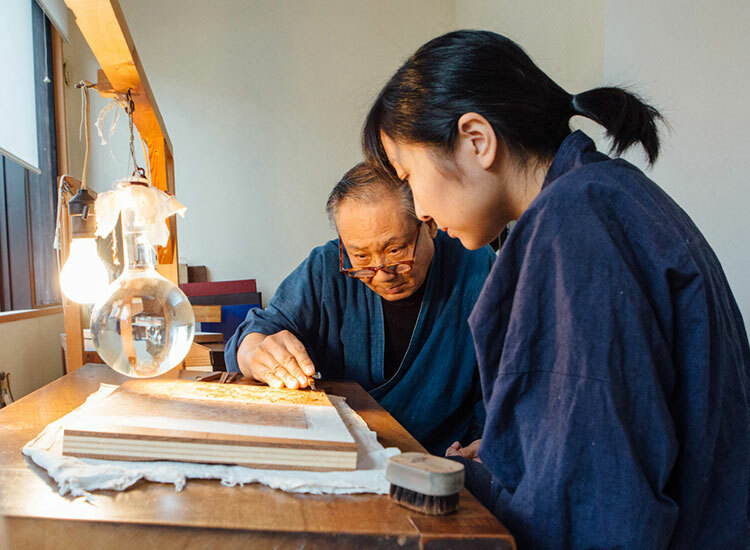 Our foundation is committed to the cultivation of successors so that we can help preserve the unique printing culture that Japan boasts to the world and pass it down to future generations. In the aim of passing on traditional woodcut printing techniques and cultivating highly skilled people who can work as artisans in the future, the foundation selects one or two trainees each year for the Advanced Skills Training Program. Every summer, we hold an internship-style workshop exclusively for people who want to apply to become trainees. Participants can gain a deeper understanding about traditional woodcut printing techniques and the work of artisans.